Amazon has finally confirmed that Long Island City, Queens, and the Crystal Lake neighbourhood of Arlington, Virginia, have both earned the dubious honour of hosting glorified branch offices for the e-commerce giant. Hiring is slated to begin next year. 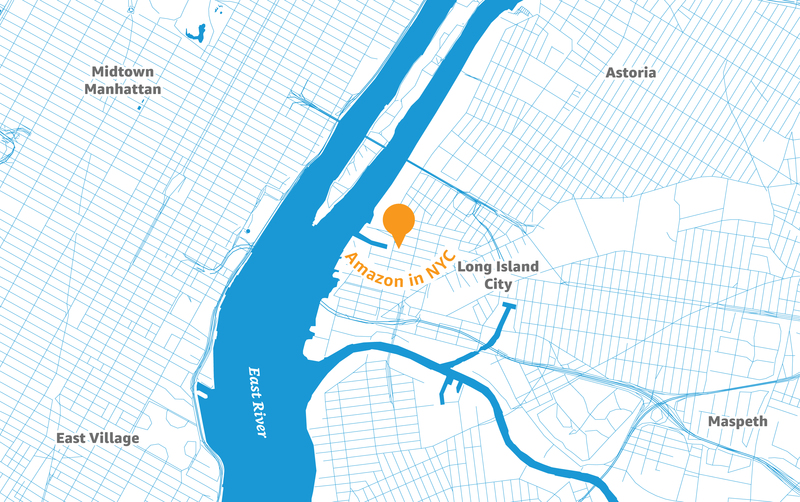 The Long Island City office is set to occupy 4 million square feet, with the option to expand to 8 million square feet in the future, and employ 25,000 Amazonians. According to the company’s own estimation, New York State will pay $1.525 billion (£1.18 billion) in performance-based incentives for the privilege – nearly as much as Amazon has received across all prior subsidies combined, according to watchdog group Good Jobs First. Arlington’s footprint and workforce are predicted to be about the same, albeit the city is only on the hook for $573 million (£443 million) in incentives. Salaries are still expected to average around $150,000 (£116,000) annually, which is around double the median household income in New York City – a metropolitan area currently struggling with rising rents and failing infrastructure. “These two locations will allow us to attract world-class talent that will help us to continue inventing for customers for years to come. The team did a great job selecting these sites, and we look forward to becoming an even bigger part of these communities,” Bezos is quoted as saying in his own Day One blog. Despite the massive year-long bake-off that preceded this announcement and mundane results, many are wondering if the requests for HQ2 bids weren’t a sly ploy to collect data on cities for other purposes. One such ancillary project was revealed by today’s press release: a new base of operations for “customer fulfilment, transportation, supply chain, and other similar activities” expected to employ 5,000 Tennesseeans. Amazon’s maps for these three locations do not have street names included. The Long Island City headquarter appears to be on Vernon Boulevard between 45th Avenue and 45th Rd. ; the Arlington headquarters looks to be on Jefferson Davis Highway near South Hayes Street; and the Nashville center correlates to the intersection of Church Street and 10th Ave. North. Congrats to all the cities that were not selected.